From every player on the field to our children in the stands, FAMILY is extremely important to our coaching staff. Above is a photo from the annual pre-season gathering of coaches and their families. Coach Kelly Donohoe graduated from Harrisonville High School (MO) in 1986. He played quarterback at the University of Kansas from 1986-1989. He got his B.S. in communications in 1990 (KU), Masters in Education in 1991 (KU) and his specialist in Education Administration in 2001 (CMSU). Coach Donohoe’s parents are Tom & Sharon Donohoe, they live in Harrisonville. His wife is Jennifer who teaches reading in the district. He has a 23-year-old daughter Taylor and a 20-year-old son Chase. Kelly has 3 brothers and a sister. Brother Shawn works in Real Estate, brother Colin works in the Los Angeles unified school district, Chad works in Lawrence, KS as an ordained Minister and sister Kara teaches elementary in Warrensburg. Coach Donohoe was an Assistant Coach for Blue Springs South from 1993-1996, head coach for Raytown South from 1997-1999 and has been the head coach for Blue Springs from 2000 to the present. On July 1, 2017, Coach Donohoe took on the role of Activities Director for Blue Springs High School after serving as an Assistant Activities Director for the previous 14 years. Coach Derek Wilson is in his 6th year as the Wildcat Linebacker Coach and 5th as defensive coordinator. Coach Wilson grew up in St. Joseph, Missouri and attended Benton High School. Following high school Coach Wilson attended Missouri State University where he earned a B.S. in Business Education in 1996. Coach Wilson obtained his Masters Degree from Webster University in 1999 and completed his Specialist Degree in the fall of 2017. Derek started his 20+ year coaching career at Park Hill High School and has coached at Park Hill South, St. Joseph Benton and Plattsburg High School as well. Coach Wilson brings years of coordinator and head coaching experience to the Wildcat program. "I have never lost sight that I have the very best job in the entire world. I get to coach the greatest game, surrounded by great kids and in a district like Blue Springs...well, I feel like I've won the professional lottery. I am truly blessed." ​Coach Matt Marble is entering his 14th season coaching for the Wildcats. Coach Marble grew up in Blue Springs where he played football, basketball and ran track for the Wildcats. He graduated from BSHS in 1999 and then attended Truman State University where he played Football for the Bulldogs from 1999-2003. Coach Marble graduated from Truman in 2004 with a degree in Communications and earned his Masters in Education from The University of Central Missouri in 2011. After working for Truman State recruiting international students and helping with the football team Coach Marble joined the BSHS coaching staff in 2006. Coach Marble coaches the varsity Defensive Backs and is in charge of the Winner’s Manual. For the past 9 summers, Coach Marble has taken senior football players on an international service trip. In 2010 and 2011 they went to Chilca, Peru to help build and orphanage. Since then, they have traveled to Harmons, Jamaica to build homes for families in the community. Coach Marble is in charge of the Broadcasting Program (Wildcat TV and Radio) at the high school. Coach Marble would be nothing without his wife of over 14 years, Adriana. Adri is an elementary Literacy Coach at Thomas Ultican. 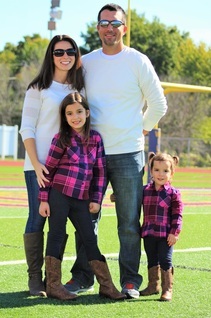 Coach Marble and his wife have three beautiful girls, Siena Grace (10) and Livvy AnnMarie (7) and Quinn Adriana (4). ​Coach Nolan Hochgrebe is beginning his 13th year coaching football at BSHS and his 18th year overall. His previous experiences include time as an assistant at Lutheran High School South in St. Louis and at Sunny Vale (now Paul Kinder) Middle School in Blue Springs before joining the BSHS staff. 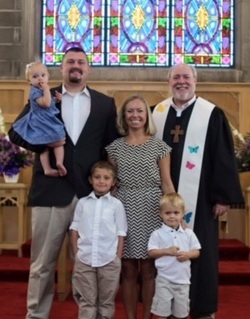 Coach Hochgrebe grew up in St. Louis, Missouri, and graduated from Lutheran High South. He earned his teaching degree from the University of Missouri-Columbia in ‘03 and his master’s degree through the MU Teaching Fellowship program in ‘04. He has spent his entire teaching career in the Blue Springs School District, splitting time between Sunny Vale (Paul Kinder) Middle School ('04-'08) and the Freshman Center ('03-'04, '08-'15) before joining the social studies department at Blue Springs High School in '15. Coach Hochgrebe and his wife, Carrie, were married in May ‘03. Carrie, also a St. Louis native and Lutheran South/Mizzou graduate, serves as the Blue Springs School District's Instructional Coach for technology. Coach Hochgrebe and his wife have 2 daughters; Taya (age 9) and Nora (age 5). This season, Coach Hochgrebe’s responsibilities include working with the tight ends, as well as helping with the technology aspects of the football program. Damon Alsup is entering his 12th year at Blue Springs and his 23nd season overall. Coach Alsup works with the running backs and works with the kick-return team. In the spring he coaches shot put and javelin on the boys' track team. Coach Alsup is a graduate of Northwest Missouri State, earning a bachelor’s degree in physical education and a master’s degree in athletic administration. Before arriving at Blue Springs in 2008, Damon was the offensive coordinator at Benton High School in St. Joseph. He also coached at South Nodaway, Maryville, Park Hill South, and Fort Osage. Damon and his beautiful wife, Kate, have been married for 12 years. Kate works as a local realtor for Reece & Nichols. They have a daughter, Gianna, who turns 11 in September, and a son, Barrett, who turns 7 in August. Coach Ryan Luethje is in his 11th year of teaching math at Blue Springs High School and his 12th year on the Blue Springs football staff. Coach Luethje graduated from Blue Springs South High School in 2005 and from Northwest Missouri State University in 2009 with a degree in Mathematics Education. He then earned his Master’s degree in Curriculum and Instruction from the University of Missouri in the spring of 2010 and his Specialist in Secondary Administration in the spring of 2013. Coach Luethje is also the head JV baseball coach. Coach Luethje married his beautiful wife, Johanna, March 2014 in Hermann, Missouri. Johanna is also an educator and is in her 9th year of teaching. She teaches English at the Blue Springs Freshman Center and is also a sponsor of Fellowship of Christian Athletes. In January '18, the couple welcomed their first child. Bennett will make his Friday night football debut in August as the newest member of the Wildcat' s coaching family. The Luethjes are looking forward to another exciting football season and year together! ​Jed Paulsen is entering his 4th year at Blue Springs and his 14th season overall. Coach Paulsen works with the offensive line. He currently teaches industrial technology education at Blue Spring High School. Coach Paulsen graduated from David H. Hickman High School in Columbia, MO. He was a 3-time 1st Team All-State selection as an offensive linemen, a heavyweight wrestling runner-up as a junior and a state champion as a senior and a 2-time football and 3-time wrestling team captain. He went on to be a 3-year starter at center for North Carolina State University, where he was a 3-time 1st Team Academic All-ACC selection and a team captain his senior year before becoming a Graduate Assistant for one year. Coach Paulsen continued his coaching career at the University of Central Missouri as the TE/strength & conditioning coach for the Mules. After earning his Masters in Secondary Administration from UCM, he spent the next 6 years as the OL coach/Strength & Conditioning Coordinator for Truman State University. Jed’s wife, Anna, currently teaches kindergarten in the Blue Springs School District. They have 3 children; Jackson (age 10), Carter (age 7), and Brynley (age 5). The family has enjoys being a part of the community in Blue Springs. Coach Watkins grew up in Kansas City, MO and attended Blue Springs High School where he played football, basketball, baseball, and also ran track. He graduated from Blue Springs in 2013 and continued his education at Missouri Western State University and was a member of the Griffons football team from 2013-2017. Coach Watkins earned his degree in psychology with a minor in Wellness from MWSU in 2018. He plans to continue his education and work towards earning his masters in psychology with an emphasis in counseling. After graduating, Coach Watkins had the opportunity to participate in the 2018 Kansas City Chiefs rookie minicamp and pursue a professional career. While still waiting for another call, he decided to return to Blue Springs and join the coaching staff at his alma mater. This will be Coach Watkins’s 2nd year on staff and his responsibilities will include helping with the defensive secondary. Coach Watkins feels tremendously gracious for the opportunity to join such a great staff and to coach alongside some of the men that he once played for. Brian Banker is entering his 1st year coaching at Blue Springs High School and will be working with the defensive line as well as teaching P.E. and health. Coach Brian Banker grew up in St. Joseph, MO and graduated from Benton High School in 1992. Brian attended Benedictine College in Atchison, KS from 1992-95 where he graduated with a B.A. in Physical Education and Health and played Linebacker for the Ravens. Coach Banker has also received two Master’s degrees in Education MAED and Administration MASL from Baker University. ​Coach Banker has been married to Amy Banker and they are celebrating their 20-year anniversary this summer. Brian and Amy have three awesome kids; Madyson (14), Brock (10) and Ella (6). All 3 kids are very active in sports and are excited about moving into the Blue Springs School District. Coach Banker is entering his 21st year in education and is bringing in many years of coaching and Athletic Director experience. Coach Banker has been an Athletic Director for 10 years and has been the Assistant Principal and District Athletic Director for the past 5 years at Lathrop High School. Coach Banker began his coaching career as a head football coach at the age of 22 at Mid-Buchanan High School in Faucett, MO. After that, Coach Banker spent time as the head football coach at Lafayette HS in St. Joseph, MO and has been a defensive coordinator and head track coach at Hickman Mills High School and defensive coordinator at Plattsburg High School. Coach Banker has also been very fortunate to be able to travel to Australia to serve as the head football coach for the Down Under Bowl for 3 years and has been able to build long lasting relationships with his students and players. Coach Banker is excited to be back on the sidelines and in the classroom and is very excited to be a part of the Blue Springs community where he will be coaching Defensive Line. Tim McElligott has been teaching for 25 years, the last 22 at BSHS. He currently teaches Sociology I and II and World History. Coach McElligott is a graduate of Truman High School in 1989. He went on to attend Central Missouri State University where he graduated with a BSE in Social Studies/Education in 1994. He received his masters in Curriculum/Education from Webster University in 1999. He has been a member of the Wildcat football staff for the past 22 years. Prior to coming to BSHS, he was the Assistant Head Baseball Coach at William Chrisman High School and Oak Grove High School. He is currently the Head Freshmen Football Coach. Also while at BSHS he has coached the C team and JV baseball and has been a part of two state championship teams in 1999 and 2007. He is currently Head Coach of the Wildcat Baseball Program. Coach McElligott is married to Tracy and they have two wonderful children, Keely (18) and Conor (11). Coach McElligott is looking forward to another great season of Wildcat football. Joel Page is entering his 5th year at Blue Springs and his 14th season overall. Coach Page works with the freshmen team. Coach Page played football for and graduated from William Jewel College. He earned his bachelor’s degree in physical education. Before arriving at Blue Springs in 2015, Coach Page was on the football staff at Richmond High School. He has also coached at Van Horn High School. Joel and his wife, Nicole, have been married for 8 years. Nicole is a 2nd grade teacher in the Liberty School District. They have 2 children; Reid (age 7) and Hattie Ann (age 3). Coach Johnson is entering his 3rd year on the BSHS football staff, however he has been a BSHS track coach for the past 6 years since his retirement in 2013. Coach Johnson graduated from Raytown South High School, received his BS in Physical Education/Biology from the University of Oklahoma where he received a full ride track scholarship for pole vaulting, and went on to get his master's degree from Lesley College. He has taught/coached 3 years KC Public Schools, 7 years Oak Grove, and 24 years is Blue Springs at various buildings. Coach Johnson and his wife Brenda have been together since they met in High School. Brenda is currently in her 25th year as a Blue Springs District employee. They have two boys Jimmy (BSHS 1995) and Christopher (BSHS 1999). They also have four grandchildren, two of which attend Blue Springs Schools. ​Coach Butler graduated from Blue Springs in 2010 and was a member of the Wildcat’s 2009 State runner-up football team. He went on to graduate from Missouri State University, where he earned his bachelor’s degree in Physical Education. Coach Butler started his career as paraprofessional at Blue Springs High School in 2016-17 while coaching freshman football and baseball. The following year, he took a position at Guadalupe Centers Middle School before returning to Blue Spring in 2018 to become the Physical Education teacher at Brittany Hill Middle School. Ty and his wife, Lauren, have been married for 5 years. Lauren sells insurance with Farmers Insurance. They have 2 children; Bo (age 3) and Maelee (age 1). Coach David Pollard graduated from Francis Howell High School (MO) in 1990 where he played football, basketball, and baseball. He played quarterback at Central Missouri State University from 1990-1992. He earned his B.S. in Education in 1994 (CMSU), and Masters in Education in 2001 (CMSU). Coach Pollard has been married to his wife Tirzah for 25 years. Tirzah works as a licensed massage therapist at Massage Luxe in Blue Springs. He has a 14 year old daughter-Jordan and an 9 year old son-Dillon. Jordan is an honors student, runs cross country, excels in swimming, and runs track. Dillon enjoys playing baseball for the Blue Springs Cardinals and loves to build and design all kinds of things. Coach Pollard retired from teaching last year after 25 years in the Blue Springs School District. He has coached football, basketball, and/or track at the middle school level for 20 years and for the last 11 years he has coached shot put and discus for both varsity track teams. In his spare time, he enjoys playing golf and in retirement he plans to keep building his financial business. He is thankful for the opportunity to work in such a great district and to be a part of this amazing football program. Lastly, he wants to thank his dad, Glen Pollard, for encouraging him and believing in him to realize his dreams. Steve Morrow is the Athletic Trainer for the Wildcats. He was born and raised in North St. Louis and graduated from Central Missouri State University in 1977 and 1978. Steve has a BA in Education, MS in Athletic Training, is a member of MOATA and a member of the NATA college of Sports Medicine. Steve spent 24 years in professional baseball working his way through college with the St. Louis Cardinals and then for the Kansas City Royals. He spent the last eight years as the assistant trainer with the Royals. This is Steve's 18th year at BSHS. Steve's family includes Terri, Stephanie and Christopher. Terri and Stephanie both reside in Blue Springs while Christopher (along with his wife Lindsay) currently lives in Maple Grove [Minneapolis], MN. In his spare time Steve runs, cuts firewood, does yard work and volunteers at his church.